Involving citizens in planning and implementation of government programs is crucial for any government to deliver inclusive growth. Giving citizens the opportunity to decide what should be done for them saves a lot of resources when governments are planning for the future of their countries. At the same time, going back to the citizens to consult them when anything goes wrong helps to build a strong bond and trust between the people and the their government. It is against this background that EPRN and IPAR with support from ACBF organized the half-day High-Level Policy Dialogue on Citizen Participation with the focus on the upcoming third Economic Development and Poverty Reduction Strategy (EDPRS 3) which was held on Friday, May 26, 2017 at Lemigo Hotel and attracted over 100 participants. The overall objective of the High-Level Policy Dialogue was to provide a platform to various stakeholders to discuss and make recommendations on how citizens’ participation in the EDPRS 3 can be enhanced after learning from the experience and practices from the EDPRS 2. This dialogue was timely given the fact that elaboration of EDPRS 3 has begun and according to the Ministry of Finance and Economic Planning (MINECOFIN), a mass awareness is planned in June 2017 for all the categories of stakeholders including citizens. The High-Level Policy Dialogue was therefore a success from the fact that participation was very impressive in fact beyond our expectations and the feedback we received was genuine and useful. From the assessment carried out on the 2016 results of Rwanda Governance Score Card and Citizen Report Card which are published by Rwanda Governance Board (RGB), we learnt that citizen participation in government programs was generally still low. For example, in planning and budgeting at district level, citizen participation remains quite low and there is need to aggressively involve the citizens in these processes in order to budget for the things that match the needs of the people. There was also low citizen participation in decision making at the district level which is also another area that needs attention. Presentation of future plans to make the EDPRS 3 more inclusive and strategy to enhance citizen participation during formulation and implementation done by MINECOFIN. The High-Level Policy Dialogue brought together 113 participants who included researchers, academics, government officials, representatives of development partners, local and international Non-Governmental Organizations (NGOs), the Private Sector and media deliberating on issues related to strategic approaches to stir up citizen participation in the formulation and implementation of EDPRS3. Rwanda’s Economic Development and Poverty Reduction Strategy (EDPRS) stems from the country’s vision 2020 and guides medium term actions that will lead to the achievement of the vision’s goals. Currently, Rwanda is implementing EDPRS2 (2013-2018) whose main goal is to speed up Rwanda’s progress towards becoming a middle-income status country and creating better quality of life for all Rwandans through sustained average Gross Domestic Product (GDP) growth rate of 11.5% and accelerated poverty reduction to less than 30% of the population. The objectives of the EDPRS 2 are ; to achieve a rapid economic growth to middle-income status, increased poverty reduction, more off-farm jobs, more urbanization, reduced external dependency and private sector as the engine of growth. The EDPRS 2 will come to end in June 2018 and it will be succeed by EDPRS 3. As EDPRS 2 comes to an end while preparations for formulation of EDPRS 3 start, there is need to look back how EDPRS 2 was inclusive in terms of bringing on board citizen participation in its formulation and implementation process and also to enhance citizen participation in planning and implementation of EDPRS 3. EDPRS 2 emphasizes citizen participation in accountable governance, one of its four thematic areas. The objective of this thematic area is to improve the overall level of services delivery and ensure citizen satisfaction above 80% during EDPRS 2. It also focuses on increased citizen participation as a way of ensuring ownership and feedback for efficiency and sustainability of the government programs. 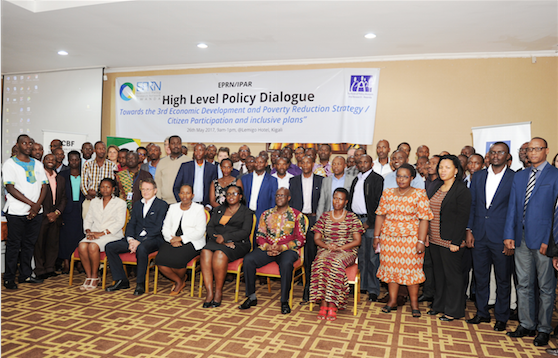 The EPRN-IPAR High-Level Policy Dialogue aimed at discussing on how the forthcoming EDPRS 3 can be more inclusive and how citizen participation can be enhanced during the formulation and implementation. The dialogue was therefore the right platform for participants to discuss strategically various ways through which the EDPRS 3 objectives can be achieved by involving citizens at the grassroots level in its formulation and implementation. The essence of this presentation was to provide an assessment of citizen participation and inclusiveness in Rwanda with a particular target on the tools used to measure citizen participation and inclusiveness in government programs such as EDPRS 2. The presenter, Dr. Félicien Usengumukiza, Head of Research and Monitoring at Rwanda Governance Board (RGB) went an extra mile and provided a relationship between economic growth, citizen participation and inclusiveness. From this presentation, it was understood that economic growth doesn’t only address inequality but it also reduces or alleviates poverty by creating opportunities for the poor and the most vulnerable members of the society. This part, he said, is quite relevant for Rwanda because the assessment done by the government even in the EDPRS 2, shows that Rwanda has been ensuring inclusive economic growth which benefits the poor. This presentation also provided an insight into the qualities of Government for Economic Growth and Democratic participation which include : Economic liberalism, Political pluralism, Social development and Administrative accountability. Through this presentation, it was understood that citizen participation and inclusiveness in planning and implementing government programs is measured by two tools including Rwanda Governance Score Card and Citizen Report Card (CRC) which were developed by RGB. These two tools provide an insight into the level at which citizens participate in formulation and implementation of government programs. In Rwanda, citizens are also consulted on global programs such as the Sustainable Development Goals (SDGs) because they are also aligned with national programs to speed up economic development and social transformation. According to Rwanda Governance Score Card, citizen participation and inclusiveness as one of the eight indicators tracked in this score card, stood at 76.48% in 2016. However, citizen participation as a sub-indicator performed relatively low at 61.93%. Citizen Report Card (CRC) shows relatively lower citizen participation at 58.9% and 51% in 2016 and 2015 respectively compared to the Governance Score Card. In the framework of promoting Good Governance principles and accountability, it was decided that 10% of CRC findings contribute in Districts performance evaluation. In some indicators, the level of citizen participation in government programs in CRC is generally below 50% which indicates less involvement of citizens. For instance, in 2016, citizen involvement in preparation of district budgets was 21.8% ; preparation of district action plans at 24.3% ; preparation of district performance contracts at 39.8% and decision making at 48.4%. However, citizens were more involved in other government programs such as elections, doing public works (Umuganda), volunteering and so many others. The higher involvement of citizens in Rwanda’s Home Grown Initiatives (HGI) such as Ubudehe, Umuganda, Gacaca, Girinka, and Imihigo was having a positive impact on social and economic transformation of the citizens and economic growth. This is evidenced by the fact that 1 million citizens were lifted out of poverty during EDPRS 1 due to the high economic growth of 8% annually on average for the past decade. The second presentation was made immediately after the coffee break by Alain Ngendahimana, Planning and Research Analyst at the Ministry of Finance and Economic Planning (MINECOFIN). The presentation was specifically on EDPRS 3 elaboration process and the role citizens are expected to play in it. It also covered the EDPRS 2. Out of the 30 core EDPRS 2 indicators, 27 have been evaluated, 5 (19 %) were achieved, 7 (26%) are on-track, 11(41 %) are on-watch and 4 (15%) are off-track and that citizens were involved at all level through different framework. MINECOFIN is now in the process of hiring a communications firm to work on a mass communication and sensitization campaign of EDPRS 3. The first draft of EDPRS 3 will be ready in July 2017 while the second will be draft will be ready in August 2017. The final draft of EDPRS 3 will be available in November 2017 after adoption of the government seven year program in September 2017. There is need for continuous sensitization of the citizens on their rights to participate in the activities that are meant for their welfare and also to demand better results from leaders especially at the local level. MINECOFIN should create an online platform through which researchers can add their input in EDPRS 3 and Vision 2050 planning process. MINECOFIN should organize one or two workshops for local leaders on EDPRS 3 planning process.